When you are done reading here, go check out what others have posted over at Soscrappy. 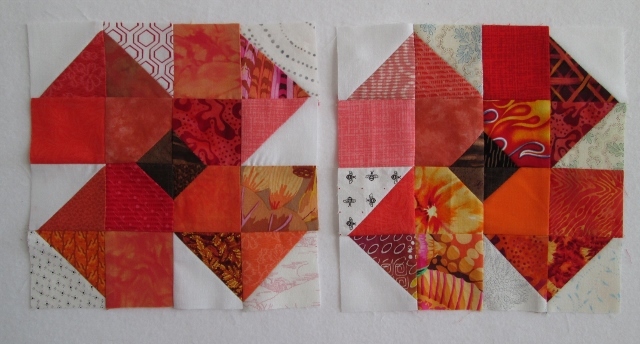 We are all working though our scraps for the Rainbow Scrap Challenge 2013. This month is Orange, January was Pink and Feb was Purple. The other colours of the month are a surprise for each of us. You can join in the fun anytime. 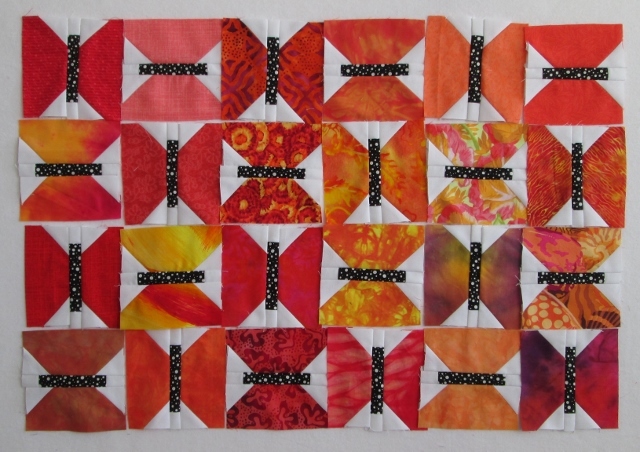 I have 24 butterflies done in orange. I got this pattern over at Bee in My Bonnet. She has been doing a row by row and this was row 2 back in Sept. She has just finished the quilt. I like some of the other patterns and may have to do more. 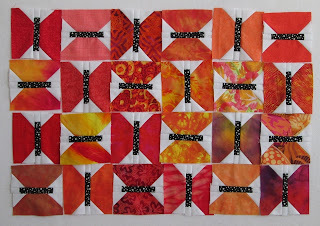 Heck, I may end up making a whole quilt more. I love the apples and cores and the Spring tulips too. There were mittens but we have so much winter I am not sure I want to make mittens. We got snowed in this week. Thur was a mess and we did not plow out till late on Friday. I got my van stuck on Wed. So we are on a forced long weekend. Spring Break is also this week. I was surprised how the photos today made my oranges all look the same. So here is a detail so show the details of my prints. I had a number of old orange Jenny Beyer prints because I bought some oranges on clearance 15 years back. I kind of wish I had some of the other colours that never made it one to the clearance shelf. I am so in love with your butterflies!!! in orange, they look like poppies! Brenda is right. The flowers do look like poppies. Love the orange butterflies. Your butterflies look great. I agree with Brenda that the orange flowers look like poppies. I love the poppies. Isn't it amazing what all half-square trianges can do? 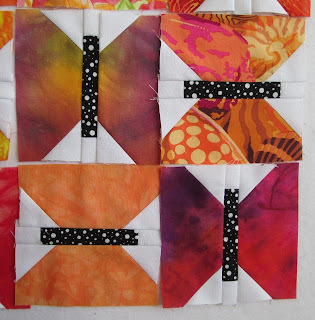 The flower blocks are really cute, and 24 butterfly blocks! Are you planning on more butterflies in other colours? They kind of look like Monarchs. Love your poppies and the butterflies. They all look great! love what you are doing here. Always an inspiration. We missed you at guild, but so glad to know that you were safely 'stuck' at home. 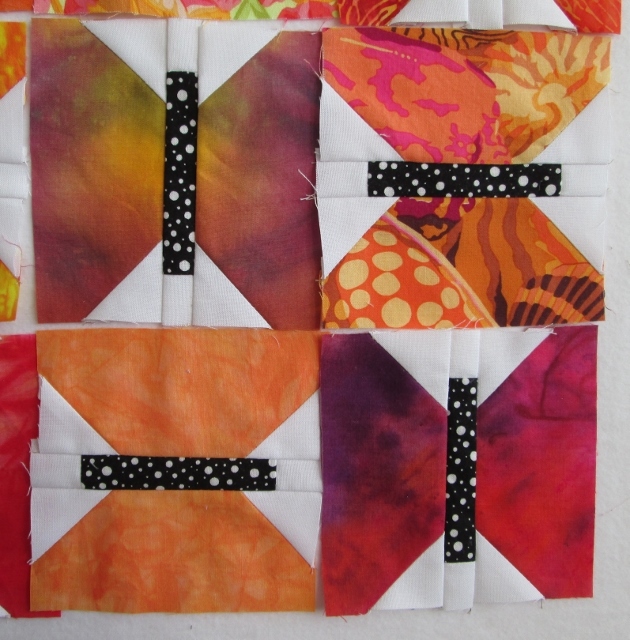 Loving your blocks! Those butterflies are perfect in orange. Love your butterflies in orange!!! And the flowers are amazing. Love the background, too. Really shows off the flowers. Oh, I love your blocks...these are wonderful. I just love your color scrap working What plans do you have in the end with all your diffrent color jobs? One big rainbow quilt?